Should I Pull the Head :(?? ?...But I'm Only Changing the Radiator! During our most recent Friday the 13th, I pulled into the Mercedes dealer to pick up some A/C o-rings...(woohoo I found the slow slow leak, at the expansion valve). The parts were waiting for me, so I left the car running with A/C on, thinking I'd be out in a minute. When I returned (I took maybe 7 minutes) the engine temp. climbed above 100 and was sitting steady at about 110. I quickly turned off the A/C and put the Heat on Max Def. I backed out of the parking spot, put it in Drive, barely moved 20 feet, when I heard a pop, and watched a stream of fluid follow me through my rear view. The Radiator tube on the top had cracked off...It was not Brass Re-inforced. So I walked back 20 feet, and there I was at the Parts Counter. I ordered a new Behr Rad, which is Brass Re-inforced at both In/Out tubes. After reading through many posts I learnt that the high pressure in the cooling system is a sign of Head failure, (was the high pressure what cracked my rad tube?) and yes I do have the original #14 Head. I currently have an oil leak coming from the head gasket, which consumes about 1 quart every 5000 Miles, which one day I'd like to fix. Is today the day??? Since I have the rad out, the fan off, the water pump & housing out, should I pull the head and examine it for any cracks? Or should I put my new rad, fan, and water pump in, and be on my way? If I do pull the head, and find no cracks can I just throw in a new head gasket and be on my way, or should I have the valves, springs, and seals changes? I look forward to everyone’s ideas and suggestions...they're always appreciated! If you're going to pull the head to R&R the head gasket anyway, sure, the sooner the better. Pulling the head if all is well is literally looking for trouble, not going to find trouble if there isn't any there, ... and if there is a slight crack it is likely that you can't do anything about it other than replace the head (and if it doesn't leak (yet) it is not an issue). However, 110* is not going to damage the head on an idling engine with full coolant and properly circulating coolant. The heat load idling is fairly low and should be equalized across the head, not hot-spotting at the exhaust ports. The pressure in the cooling system is limited by the (properly operating) cap on the expansion tank, temperature shouldn't have caused a problem with the radiator neck. A cracked head will have no ability to cause the radiator cap to pressurize beyond its relief pressure. I think what you're doing is already overkill, the original fan and clutch if operating properly are fine, do be sure the electric (auxiliary) fan is operating though, it sounds like it might not be. The new radiator will probably keep the car at a nice operating temperature compared to an old fouled one with junk between it and the condensor. The Green sensor on the drier is toast, it doesn't kick on the aux fan. Last summer I ran a bypass to manualy switch the fan on low or high speed into the 2 switches I placed into the ashtray. Turned out to fit in their nicely. Now that I'm opening the A/C to change the o-rings and the drier, I'll be putting in a new Red sensor. The Green 3-Prong sensor on the head, which controls the High speed on the aux fan is also shot. I don't know what temp. its suppose to kick in at, but I've never in the hottest day see it kick in, plus when I took out that sensor, the part that should look Brass in color looked darker than oil, so its fair to say it needs a change, plus I read that the Grey colored sensor kicks the aux fan into High speed sooner. The fan clutch had some play in it, plus a 21 year old clutch may not be working at par anymore. The junk between the Rad and Condensor was limited, but I'm sure the new rad will keep things cooler, as the original was showing signs of failure with coolant spots here and there. Speaking of junk between the Rad and Condensor, when I took out the plastic cover at the front of the 2 aux fans / Condensor on my 90 300D, I think about 2 lbs. of debris fell out from the bottom. I wonder why they added this cover to the new models??? As it restricts air flow to the bottom part of the Condensor / Rad. Well kudos for the preventative maintenance, too many go into the abyss from waiting too long. Should be a happy car this summer. As Jeff suggests, or maybe I'm misinterpreting him , once a 14 head comes off, there's little reason to put it back on. Subtract the cost of getting a 14 head properly inspected from the cost of a good used 17 or higher head as you do the cost/benefit analysis. A quart per 5000 miles is hardly reason to pull the head, IMO. If you go from a #14 to a 15, 17, 18, 20 or 22 head are all the parts from the original head interchangeable? Camshaft, lifters....etc. Pretty much everything except for the pre-chambers and injectors. 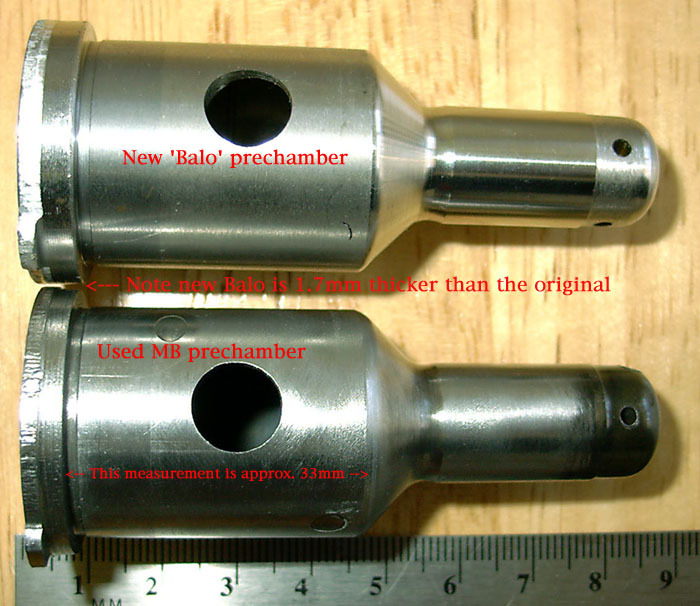 Prechambers and injectors are different from at least #17 and up. 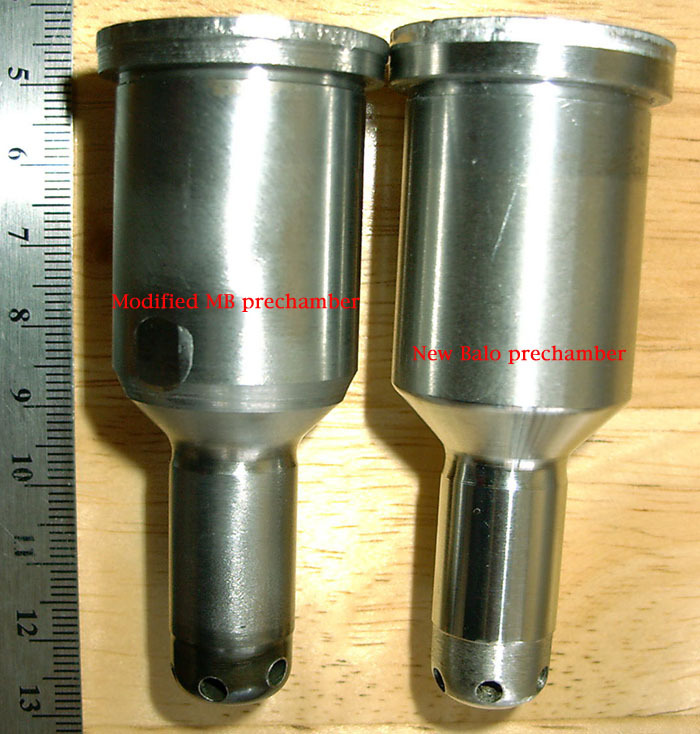 #14 prechambers can be modified to fit #17 and up heads so you can keep your injectors. I've had good luck keeping #14 fuel lines with a #20 and #22 head. I see no need to get new lines but others advise it because of the change in injector inclination. I've had good luck running #14 injectors on a #22 head on a 3.0 block the 3.0 pump and #17 and up injectors on a 3.0 block with a 3.5 pump. Seems to me everything's interchangeable. You also need longer bolts at the very front of the head into the timing chain cover. I think I'll wait until I come across a updated head, but even then changing all the valves, springs, etc in the head, is it a DIY?? ?...when I pulled the head on my 90 300D I gave it to my indy and he cleaned it, rebuilt, etc. 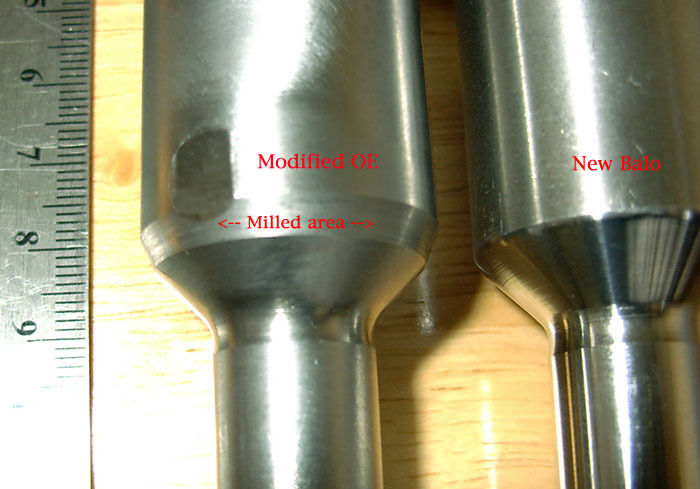 How did you modify the prechambers? It their a difference between each updated head #, which is the most reliable and most compatible? Do you know which models carry the updated head #'s? I'm heading to Germany this summer, maybe I'll hit a scrap yard there...wow i'll be like a little kid in a toy store. Does the head weigh less than 20kg??? The airline will charge me excess weight. If you get the FSM, it shows the tab that identifies a turbo head. Be careful buying a used head from outside the US as it could be a non-turbo. 17, 20 and 22 are the most common heads found in the US. Each is an improvement over earlier heads so the higher the casting number the better though it doesn't seem that 17 heads are more problematic than 22s. Put another way, it doesn't seem that 22 heads are less likely to eventually need a new head gasket than 17s. Maybe you should pay more attention to head gasket selection than head selection. The 17 head was original equipment on 90-91 350SD/Ls, 92-93 300SDs and 94-95 S350s. 20 and 22 were replacements. I don't know if factory crate engines came with later head designs. I wouldn't pay more money for anything newer than a 17 but I'd take the newer head everything else being equal. There are 603 turbos in Europe. It's easy to tell one head from another with both sitting side-by-side. You pretty much have to go by the casting number. Note that some normally aspirated 603s have an SLS pump ahead of the crank sprocket. I've never seen a 603 turbo with such an SLS pump arrangement. That might help in your identification. I would guess a head with valves but no cam is more than 20kg. I'll have to search through the archives and GSXR's library for his instructions on trimming #14 prechambers to fit a #17 head. If my figuring is correct, 110C is only 198 degrees F.
Unless bad temp gauge reading, I wouldn't think head was warped. Last edited by babymog; 06-24-2008 at 10:08 PM.